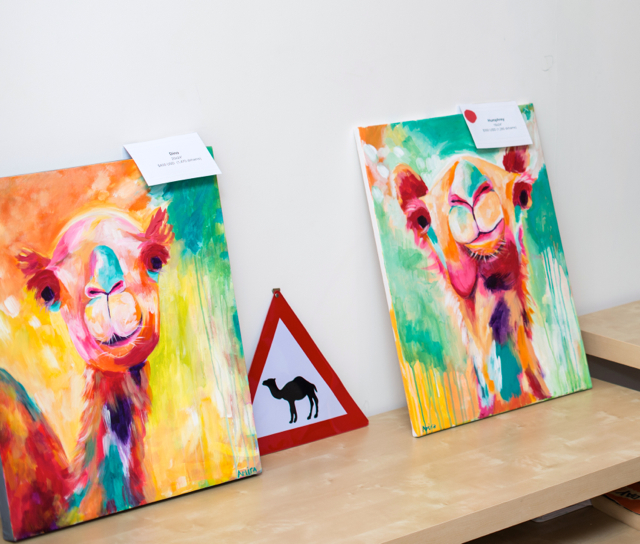 Art Party with Amira Rahim: Pictures & Recap! Hey guys, it’s been a crazy busy last few weeks. I spent the last half of April painting like it was going to go out of style and boy am I glad I did! It’s certainly difficult to paint under pressure and under a narrow deadline, but I had a lot of inspiration building up over the last few months. I was able to paint traditional landscape scenes with an abstract twist, but I also got really inspired by cute camel faces. Camels are kind of cute and goofy-looking at the same time. I knew I wanted to use an abstract color scheme, and once I got a few reference photos of camels smiling and winking, I couldn’t stop. Along came “Dino” and “Humphrey” and I will be painting many more since they have been very popular amongst us expats. In other news, we’re moving! I can’t believe a year has passed of me living in Abu Dhabi. I’ve shared the highs and lows on this blog. It wasn’t an easy adjustment, but I do believe the first year abroad is the hardest and looking forward to the year ahead. We’re moving to Gate Towers on Reem Island and the apartment and facilities are just amazing. I have a separate room for my art studio, which I will be happily reporting to once we’re all moved in. I can’t wait to push some paint around again. One week break is kind of too much! Thanks all who came out to the event last Wednesday, and stay tuned for more work. Have You Ever Commissioned An Artist To Do Work? Here Is How It Works! My Artist Interview in The National!